CLASSES: Mondays and Wednesday 4pm / Tuesdays and Thursdays 5pm / Saturdays at 12-midday. 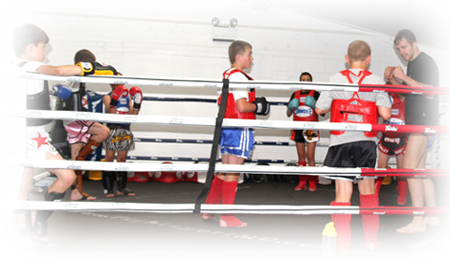 Muay Thai is a great way for children to make friends, have fun and build character. We hold five dedicated lessons for children aged between 8yrs and 12yrs old. At Crawley Lumipini Muay Thai we know how important it is for children to keep active and entertained. Muay Thai will teach your child balance, co-ordination, and timing as well as aiding the development of hand-eye co-ordination and basic martial arts skills. The techniques we teach wil help your child grow in confidence as we start to encourage them to work together carrying out controlled drills and padwork. Each child is recognisd for their effort and individual achievements as they learn more advanced techniques in a safe and friendly environment. Crawley Martial Arts Academy offers free parking. Parents are encouraged to stay and watch via our viewing gallery, stay and have a coffee in our club cafe or use our internet facilities. Any questions feel free to call the club on 07702 119 198 for more information.